Gettysburg, Manassas, and Antietam are famous Civil War battles remembered for President Lincoln’s address, the turning point of the war, and the bloodiest battle of the war. They are also battles that took place in states surrounding Washington, DC – within 100 miles of the nation’s capital. This week marks the 150th anniversary of the only and relatively unknown battle that took place in Washington, DC, the Battle of Fort Stevens. A Historic Resources Study: The Civil War Defenses of Washington by the Department of Interior’s National Park Service follows the history of efforts to defend Washington, DC from the city’s conception in the 1790s to the Civil War and the Battle of Fort Stevens. This publication is very descriptive painting a clear picture of what Washington, DC was like during the Civil War. The Union constructed a fortification system to protect Washington, DC that by the end of the war consisted of 68 enclosed forts and batteries, emplacements for 1,120 guns, and 20 miles of rifle-trenches. Because the city was the capital and the location of war departments and bureaus it had the largest collection of supplies, equipment, and materials. In the Foggy Bottom area where the Kennedy Center, George Washington University, and the Department of State currently sit, there was a depot of 30,000 horses and mules and the Washington Monument grounds housed an Army cattle-slaughtering yard. Company F, 3d Regiment Massachusetts Heavy Artillery assembled at Fort Stevens. Photo by William Morris Smith, courtesy Library of Congress. The Battle of Fort Stevens is the grand finale of the publication. After establishing the condition and role of the Washington, DC during the war, the book goes into step-by-step detail of the battle. Here is my perceived synopsis of the Battle of Fort Stevens: General Robert E. Lee of the Confederate army gave orders to Lieutenant General Jubal Early to threaten Washington, DC, which had remained largely untouched during the war. Early led his troops through Virginia and Maryland, taking part in different skirmishes along the way. On July 9 at the Battle of Monocacy near present-day Frederick, Maryland, Early defeated the Union army, thereby opening up the route to Washington, DC. 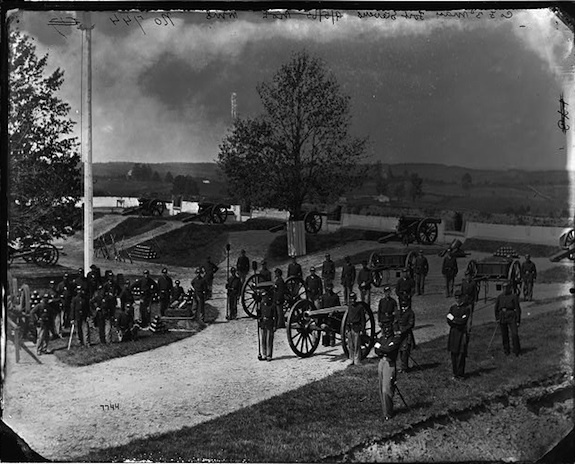 The Battle of Monocacy temporarily stalled Early, giving General Ulysses Grant more time to send reinforcement troops to defend the capital – ultimately derailing Early’s efforts. The Battle of Fort Stevens started on July 11 and ended with Early withdrawing his troops by July 13. 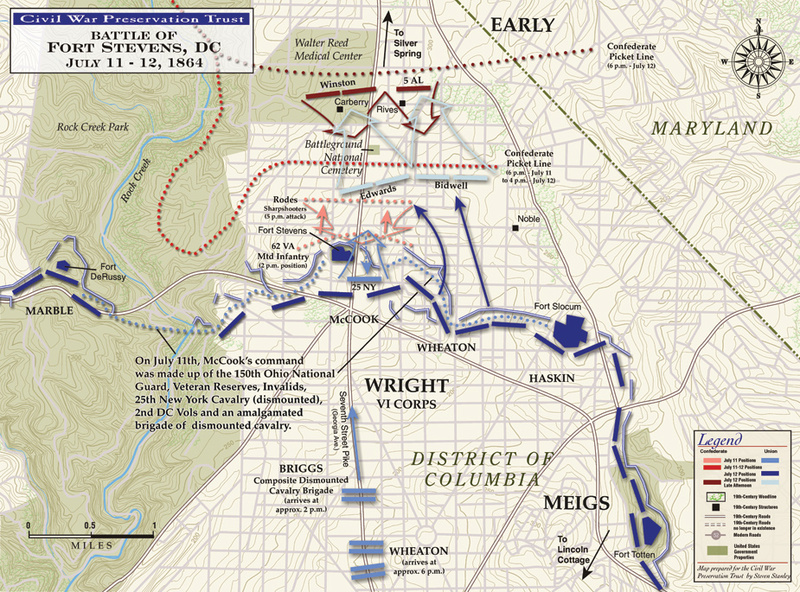 The Confederate troops moved towards the Capitol along Georgetown Pike and Rockville Pike culminating in the Battle of Fort Stevens, which took place with the Capitol dome in sight – six miles away – on what was mostly open farm area around present-day Georgia Avenue near Rock Creek Park. The reinforcements sent by Grant and reports suggesting more Union troops were coming caused Early to retreat and end his pursuit of the city. GPO’s early history is intertwined with the Civil War. One of GPO’s most significant print jobs was the preliminary version of the Emancipation Proclamation produced in September 1862. Aside from production work done by the agency as part of the war effort, some GPO employees were part of the Interior Department Regiment organized to protect the city. With the threat of General Early closing in on Washington, employees were called on to defend the city but not needed when the reinforcement troops sent by General Grant arrived. During the 150th anniversary of the Civil War, think beyond the famous battles of the war and remember the skirmishes and other important battles like the Battle of Fort Stevens that may be unknown but are just as important. We are starting a new series to feature various Federal agencies of note as Agency of the Month. With it being National Military Appreciation Month in May, Armed Forces Day this Friday and Memorial Day coming up in under two weeks, it is appropriate that we highlight one of our most distinguished and prolific agency publishers: the United States Army Center of Military History. 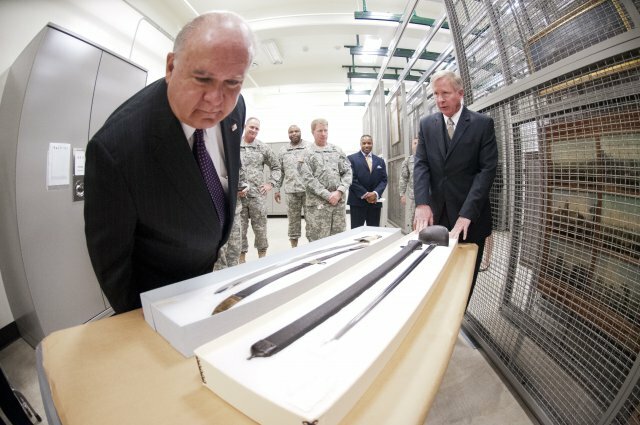 Maintaining the organizational history of Army units, allowing the Center to provide units of the Regular Army, the Army National Guard, and the Army Reserve with certificates of their lineage and honors and other historical material concerning their organizations. Under the direction of the Chief of Military History and his principal adviser, the Army’s Chief Historian, CMH’s staff is involved in dozens of major writing projects at any one time. Topics can range from those that involve new research such as traditional studies in operational and administrative history (from the present on back) or the examination of such areas as procurement, peacekeeping, and the global war on terror, to name a few. The Center serves as a clearing-house for all oral history programs in the Army, as well as conducting and preserving its own oral history collections, including those from the Vietnam War, Desert Storm, and the many recent operations. Its famous end-of-tour interviews of officials within the Army Secretariat and Staff are critical for providing a basis for its annual histories of the Department of the Army. With hundreds of top-quality publications available from the Center of Military History, and many of these award-winning books, it’s hard to choose just a few, so I’ll highlight some currently available titles that are not only my personal favorites, but that also just happen to be customer favorites and best-sellers as well. The Center traces its lineage back to those historians under the Secretary of War who compiled the Official Records of the Rebellion, a monumental history of the Civil War begun in 1874. Today with America honoring the 150th anniversary of the Civil War, the Center returns to those roots by producing a series of commemorative campaign brochures for the Civil War Sesquicentennial. Find instructions on ordering the ePub eBook format. Additional brochures covering Chancellorsville, Vicksburg and Gettysburg are due out after Memorial Day. This full-color magazine has articles spanning the gamut of Army history topics by a myriad of knowledgeable authors. For example, the Spring 2013 issue features these guest articles: “The Doughboys Make Good: American Victories at St. Mihiel and Blanc Mont Ridge“, by Mark E. Grotelueschen and “The Indomitable Dr. Augusta: The First Black Physician in the U.S. Army“, by Gerald S. Henig. Regular columns in Army History include: News Notes, U.S. Army Artifact Spotlight, Book Reviews and Chief Historian’s Footnote. How can I obtain the Army History: The Professional Bulletin of Army History? Perhaps my personal favorite is The U.S. Army and World War II: Collected Works (DVD). It is a comprehensive DVD compilation of PDFs of every book on World War II that the Center of Military History every published, which encompasses an astonishing 156 volumes! For fans of World War 2 history, it doesn’t get any better—or more comprehensive—than this, as battles, tactics, and outcomes are sourced straight from those who were in the thick of things and analyzed by top historical experts. How can I obtain “The U.S. Army and World War II: Collected Works (DVD)”? Thus, as we honor our members of the Armed Forces this week and remember our lost servicemen and women on Memorial Day, we can be comforted by the fact that the dedicated team at the Center of Military History is there to ensure that their sacrifice, wisdom and experiences are not forgotten. CMH Website: For more information about the Center of Military History, visit its webpage www.history.army.mil which also provides a link to CMH’s online publications catalog.